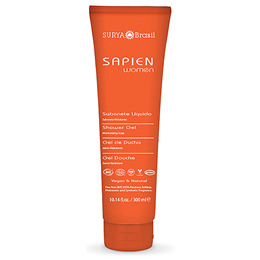 Surya Brasil Shower Gel is vegan, natural and rich in exotic organic Amazonian ingredientes like Pracaxi oil, Aloe Vera juice, Amaranth protein and Vitamin E, which protect skin and provide deep hydration. Surya Brasil is a 100% Vegan, Natural and Organic Sustainable Beauty range from Brazil. Bringing together Nature, Technology and the Science of Ayurveda to create an amazing range of beautiful, healthy and ecologically sustainable hair and beauty products. Water, *Aloe Barbadensis Leaf Juice, Decyl Polyglucoside, Disodium Cocoyl Glutamate, Cocamidopropyl Betaine, Glycerin, Sodium PCA, Fragrance, Dehydroacetic Acid Benzyl Alcohol, Xanthan Gum, Hydrolyzed Amaranth Protein, Carrageenan, *Penthaclethra Macroloba Seed Oil, Tocopherol. *INGREDIENTS FROM ORGANIC FARMING 98,88% of the total ingredients are from natural origin. 12,09% of the total ingredients are from organic farming. Apply to sponge, loofah or hands and leather generously all over your body. Rinse well. Always do a 48 hour patch/strand test prior to use. 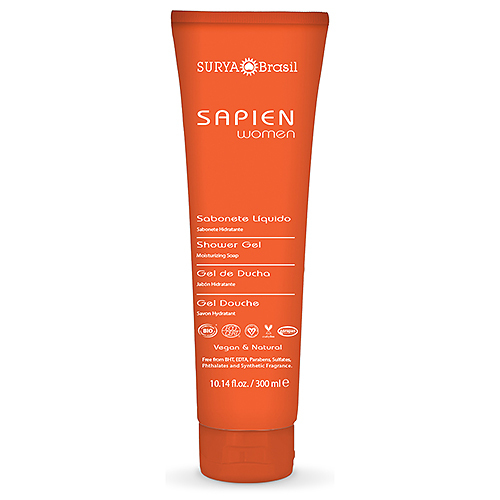 Below are reviews of Surya Brasil Shower Gel - Sapien For Women - 300ml by bodykind customers. If you have tried this product we'd love to hear what you think so please leave a review.